Denim is the workhorse of your entire wardrobe. It's a fabric so utilitarian and versatile, that it works for nearly any occasion. From basic blues and richer hues, to old school jean jackets and rugged shirts, here are the four pieces every man should have in his sartorial arsenal this autumn. Brought to you by the design team at Lucky Brand, who've been crafting and washing denim in Southern California for two decades. A dark pair of selvedge denim is eternally in style. And no, you don't have to suffer wearing a stiff pair of raw jeans. 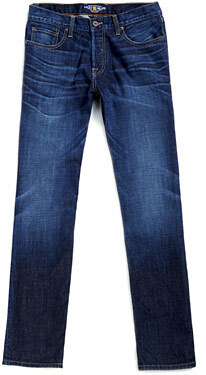 Simply look for some with a subtle wash like this American-made pair, tailored with a slight taper to the leg. It's the ideal way to introduce some bold color into your wardrobe. 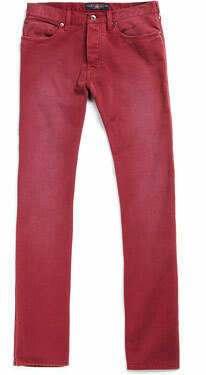 The familiarity of soft, worn-in jeans in rich, over-dyed hues. For those brave enough to go beyond basic blue, look for of-the-moment shades like orange or washed out red. 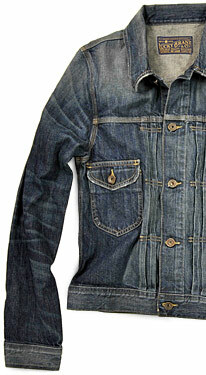 Plain and simple: A denim jacket is a timeless piece of outerwear every man should own. It's an excellent layering piece under blazers, Barbours and even suit coats (as we discovered during men's fashion week). This one here has archival details like pleating near the placket, lower patch pockets and a buckle back. Whether you're sporting it with white jeans and a khaki blazer, a pair of beat-up chinos or even a suit, denim's cousin fabric, chambray, can easily run the gamut from workwear to ruggedly refined. 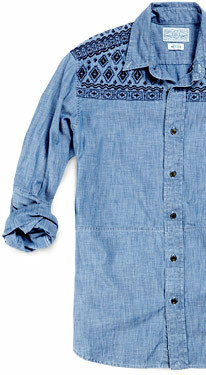 This iteration hops on the Baja bandwagon with some ethnic embroidery at the shoulders. All Lucky jeans have the phrase "Lucky You" stitched into the fly. The most important factor to consider when buying jeans. Our handy guide for the best results.